Despite a dry winter and below-average snowpack, water levels remain high in lakes along the Arkansas River managed by Colorado Parks and Wildlife, causing the closing of some roads, fishing and picnic areas and even a boat ramp. 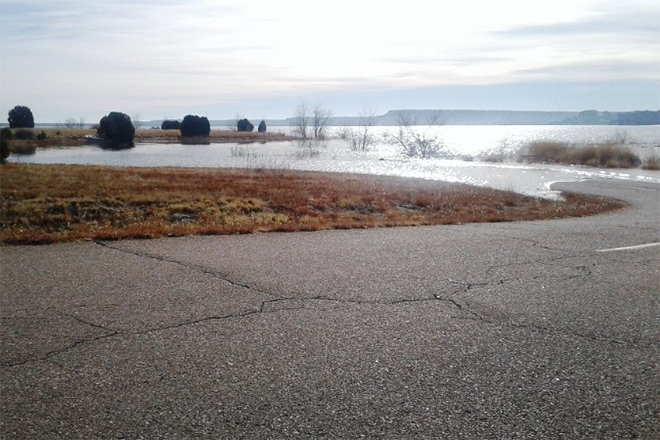 The U.S. Bureau of Reclamation attributes the bounty of water at Lake Pueblo State Park and John Martin Reservoir State Park to above-average runoff the previous four years in the Arkansas River Basin. In addition, cities that own storage in the lakes filled their accounts in preparation for future drought conditions, pushing lake levels unusually high. Then a wet spring and summer on the eastern plains in 2017 caused agricultural water users to leave water in storage, further compounding the high-water situation. 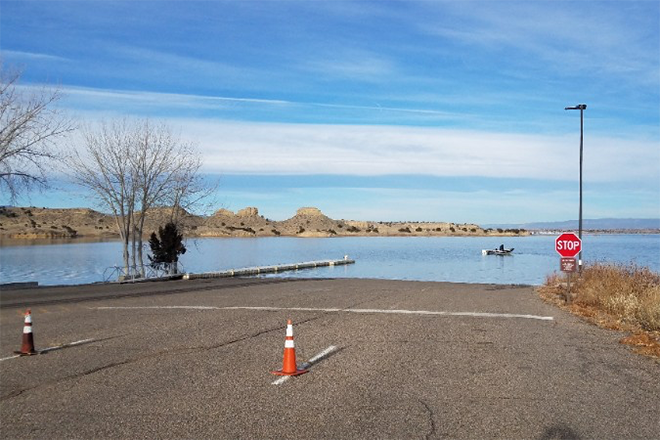 At Lake Pueblo State Park, the most-visited park in Colorado, high water levels have closed motor vehicle access to most shore areas including: South fishing, N-1, Sailboard and North Picnic. Visitors can walk into the areas, but vehicles are not allowed. Park Manager Monique Mullis said the best place to access the shoreline reasonably close to parking is in the day-use areas in Juniper Breaks Campground. "Just remember to use the parking spaces and not a campsite," Mullis said. "Only occupy a campsite if you have a valid camping pass. " Even the South Ramp is closed due to high water, although the South Marina remains open. "The South Ramp should reopen no later than April 16," Mullis said. "We hope the water will go down quickly enough to get it open sooner - perhaps in late March." For now, the only place to launch is from the North Ramp, Mullis said. She noted that CPW has no control over the water in Lake Pueblo, which is owned by the Bureau of Reclamation. The bureau-built Lake Pueblo in 1970-75 as part of the Fryingpan-Arkansas water diversion, storage and delivery project. It provides West Slope water to upwards of 1 million Front Range residents, primarily in southeastern Colorado. It also serves an important role irrigating farms in the region. "We do not anticipate water levels to rise enough to close the North Ramp," Mullis said, noting water would have to climb another 11/2 feet to jeopardize it. 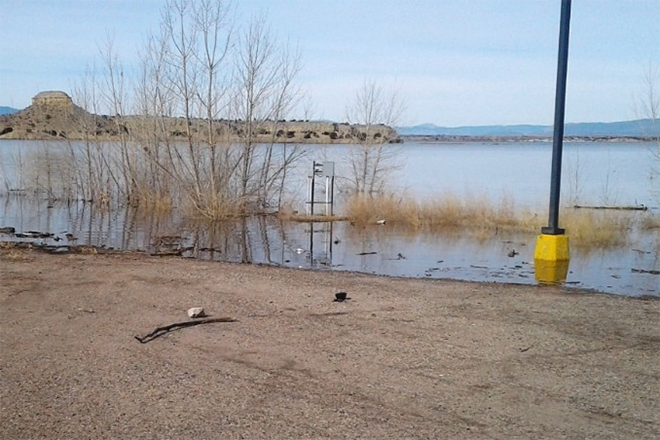 Lake Pueblo's water level is measured by elevation. On Monday, its water level was 4,887 feet elevation and a Bureau of Reclamation official believes it may have peaked. The dam spillway is at 4,898.7 feet. "The water level would have to reach 4888.5 feet for the North Ramp to be in jeopardy of closure," Mullis said. "The highest it has ever been is 4888.3 feet in 1996. We will be in uncharted territory if it gets up that high." It's a similar story downstream at John Martin Reservoir State Park near Lamar. The flood control and irrigation dam was built by the U.S. Army Corps of Engineers and opened in 1948. It is so full that water has closed several roads around its expanding shoreline, which typically stretches 22 miles. "If we get much higher, we'll have another county road closure," said Dan Kirmer, park manager at John Martin. "But our park boat ramps are still accessible." In fact, the Corps has been releasing water intermittently from the reservoir with flows as high as 60 cubic feet per second during the winter, Kirmer said, with much smaller ongoing releases around 5 cfs. As a result, water levels have remained around 3,849.44 feet elevation, just below the maximum conservation pool of 3,851.87 feet. "We still are a little below July 2015 levels, which were the highest I've seen it," Kirmer said. Regardless of the high water, John Martin ramps, campgrounds, picnic areas and other infrastructure are not affected, he said. "On March 15, when the boat inspection stations for aquatic nuisance species resume operation, our park boat ramps will reopen," Kirmer said. "Everything will be open." March 15 is a big day for another reason at both parks. It's the first day agricultural users can begin "calling" for their water to be released from storage in the lakes, which could ease some of the pressure and cause levels to begin dropping. The next key day in the world of water is April 15 when each lake must get down to "flood control" levels to ensure each has enough capacity to handle any flood waters that could occur from a quick snowmelt or heavy spring rains. There could be a significant release of water from both lakes to reach the flood control level.